The Tenth Edition of "Organic Chemistry" continues Solomons/Fryhle's tradition of excellence in teaching and preparing students for success in the organic classroom and beyond. 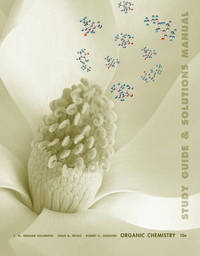 In the Tenth Edition, virtually every aspect of the teaching and learning solution has been revisited and redesigned to assist students in comprehending the fundamentals of organic chemistry. The authors' thoroughly explain and illustrate each new idea when it is first introduced and then reinforce the new idea or concept by having students work related problems.